LOOK who it is!!! It’s 13-year old-Fannie and her recently-found forever mom, Lauren!! Fannie is the gal who was living at the Austin Pets Alive! animal shelter in Texas for more than 1,000 days. We put her story on SSD. Twice. The first post was a dud. Nada. Zero adoption applications. Fannie needed to be adopted as the only pet, but that’s hardly an issue. 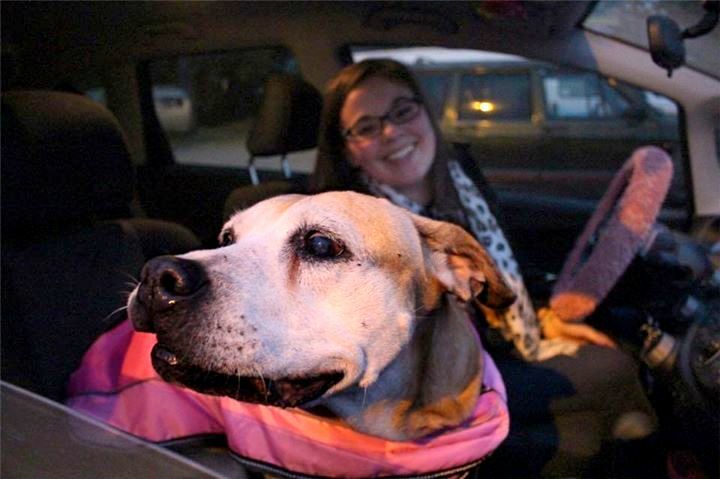 There are tons of single-dog adopters out there. So we shared again, and the second post garnered Fannie over 7,100 well-deserved shares…which (finally!) landed her in Lauren’s lap — her miracle mom! 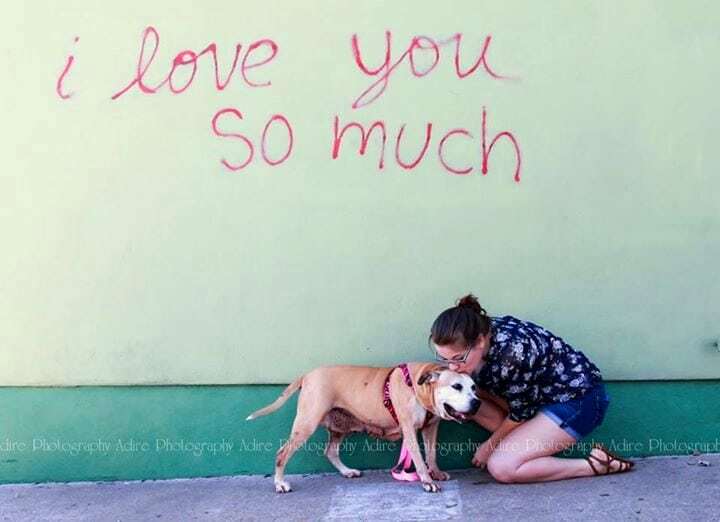 Fannie and Lauren recently had a photo shoot with pet photographer Gloria (of Adire Photography) who volunteers her photography skills for homeless dogs at animal shelters. Yes, yes you are a very special person, Lauren. We love you and Fannie! They may not have seen it.its crap fb wants 10$+ a day to promote our post.especially on pages like this. Awwww, this made me tear up….happy she got a home. Confined for 1000 days! How is it legal to keep an animal caged that long and it not be a crime? Yet, pet owners or breeders get arrested for doing the same with shorter cage confinements. judy, did you read the article? The dog wasn’t “confined”, he was living in an animal shelter, waiting to be adopted. Owners that cage their animals and especially back yard breeders, SHOULD be arrested for doing what you are talking about. This shelter didn’t do that. Judy, I don’t understand your post. 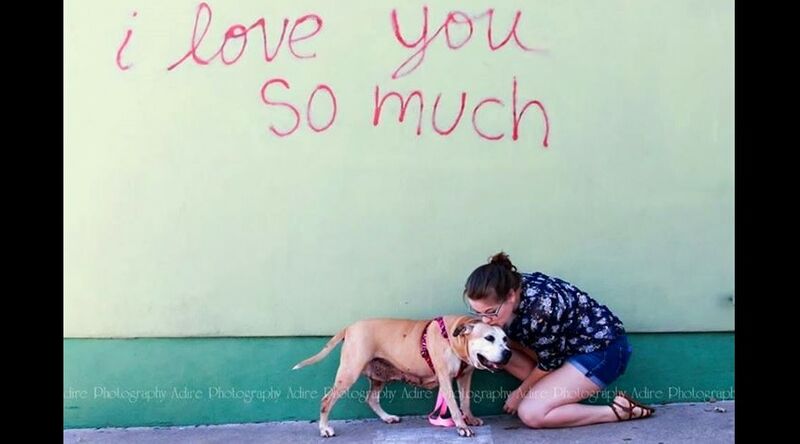 She was at a shelter for 1000 days because no one wanted her. She was being cared for and let out to exercise. Otherwise she would have been roaming the streets or Euthanized. I think you missed the point of the story. What exactly should they have done Judy? Euthanize her? Really? You disgust me. You are probably a freaking breeder of a puppy mill. You missed the entire point of the story. I suggest you learn to read. The article didn’t say ANYTHING about the do being in a cage. So I guess you would want her murdered than kept in a kennel to have someone find her and love her the way she should have been instead of being given up. wow Judy you should have shown up to rescue her so she wouldn’t have been stuck there for 1000 days. would you have preferred that she been killed? Lauren and Fannie are two lucky girls to have found one another. Bless you, Lauren. Karma will find you sweet girl. Yay for Fannie! So happy she finally found her forever family. Happy way to start my day! God bless all those who rescue and adopt!!! The story made me smile and cry at the same time. I’m so happy there still are good people on this earth. I heart Lauren! How awesome is she to love Fannie! Lauren sure is beautiful…and her heart as well. Bless you! I know exactly where this picture was taken! Perfect background. 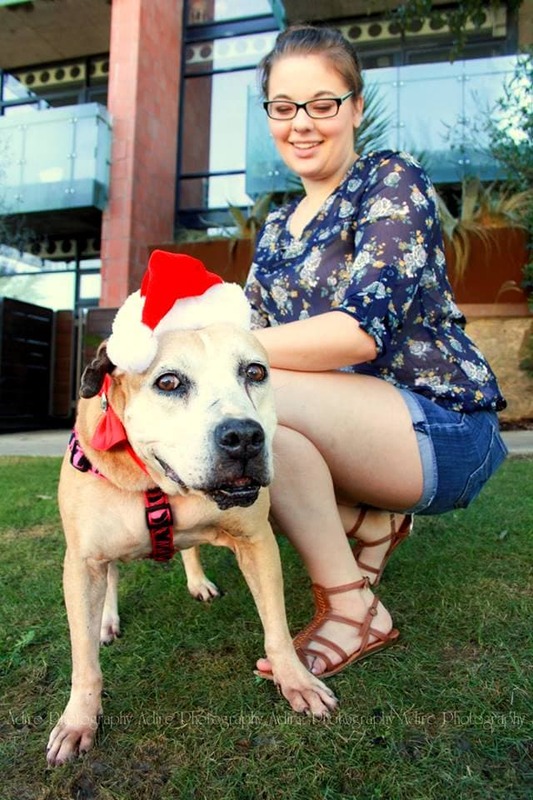 Happy Holidays with lots of love to you for giving this beautiful senior gal a loving furever home! thank you Lauren for taken the poor dog in! Shared. Thank you for the link Suzanne and thank you Lauren! The world needs more Lauren’s! Wishing Lauren and Fannie nothing but love and happiness. Thank you Lauren! You are a sweetheart! Glad she found a home! Let’s hear it for no-kill shelters & tons of love and patience. Wonderful. Thank you for adopting Fannie and giving her a kind, loving home full of good things. You are a very special person ! Hugs to you both! I can barely type through the tears. So happy! Lauren you’re one in a million good on you. What a heartwarming story. Bless you Lauren and may Fannie live a long time! Hug and kisses to both of you! I adopted a very sick 15 year old dog over four years ago. Today, she acts like a puppy! The power of our love makes dogs strong and healthy. Hear’s hoping and praying Fannie and Lauren enjoy many years together. I hope she lives to be 20 or more. You are my hero and hers. You are both so lucky to have found each other. Thanks for caring enough. Awesome news …. please keep them coming!!! Blessings to you, Lauren!!! There is nothing like the love of a senior dog. Thank you for not being afraid to bring this precious girl into your heart and home. God Bless you Lauren. May you and Fannie give each other much love and happiness. I LOVE HAPPY ENDINGS <3 Yay Fannie!!! Thank you for having a big heart to give Fannie a home- you are one special person. My heart is filled with gratitude…..